Donkeys are disappearing faster than tigers in Madhya Pradesh, going by figures released by the state animal husbandry department. As per the recently-released 19th census report, the donkeypopulation in MP went down by 75 per cent -- from 49,289 in 1997 to 14,916 in 2012. While the state government blames modernisation and "uselessness" behind its decline, the NGO International Organisation for Animal Protection (OIPA) has petitioned Prime Minister Narendra Modi and other Union ministers to declare donkeys as 'endangered species.' 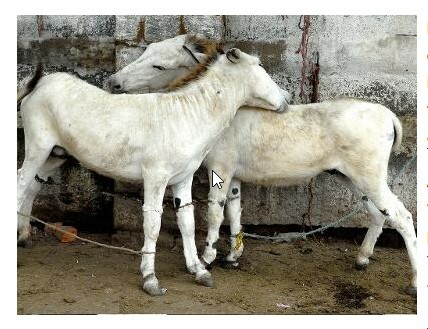 It claimed that China is buying donkeys, including those from Madhya Pradesh, for use in the production of medicinal tonics, aphrodisiacs and anti-ageing creams. Donkey hides are boiled to extract a gelatin, which is a key ingredient for ejiao, one of China's most popular traditional remedies. Ejiao is used for a variety of conditions including bleeding, dizziness, insomnia and dry cough. The edible form of ejiao is often mixed with almonds and sesame seeds and served as a snack in certain Chinese provinces. The animal husbandry department conducts a survey of cows, buffalos, goats, donkeys, mules and other domestic animals in the state every five years. The last one was conducted in 2012. The 2017 census is slated to start in March first week and officials believe the count would be alarmingly low. "We have specific inputs that donkey hides are being smuggled out of Madhya Pradesh to exporters in Delhi and Maharashtra at throwaway prices," says Naresh Kadyan, OIPA representative in India. Existence of donkeys will be restricted to 'Panchatantra' stories if immediate steps are not taken, Kadyan said, adding that there are more than 100 export companies within India that is trading in donkeys hides for a meagre Rs 10-20 per hide. "After being barred from African countries, China is now increasingly looking to India and Pakistan to increase its stockpile of donkey hides," says Sukanya Berwal, OIPA's Program director.MP government officials accept the fact that donkeys are disappearing by the day, but they blame something else for that. "They were used for centuries to transport material, but now they have fallen victim to modernisation. They are useless and it is the only reason why their population is on the decline," said Dr R K Rokde, director of the state animal husbandry department.